Karen is an I-ACT certified colon hydrotherapist. She has developed specialty cleanse programs in Austin aimed at providing the amount of supervision and support that most people need to be successful. Fatigue, bloating, digestive issues, even allergies and fibromyalgia can be a direct result of the body being overloaded with toxic substances found in our food, water, and the air we breathe. Lake Travis Wellness Center specializes in programs aimed at rehabilitating your digestive system and cleansing your entire body. A toxic body is a sick body, and most cleanse programs do not provide adequate support or supervision. Come in for a free consultation or contact us online to learn more. The goal of Lake Travis Wellness Center is to get you healthy without a lot of pills or surgery. Surgery and drugs should be your very last resort. Many times, your issues can be relieved by a simple method. Dysfunction is your body’s way of screaming “something is wrong.” Your session time will be spent looking for and eliminating the underlying causes and contributing factors that caused your health problem in the first place. 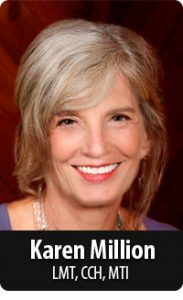 Karen Million is a nationally certified massage therapist with over 1800 hours of training in different soft tissue modalities. She has over 11 years of experience using trigger point and myofascial techniques helping clients to become pain-free. She trained at the Colorado Springs Academy for Therapeutic Massage, graduating with 1300 hours of training, including 100 hours of actual clinical practice. Karen has trained in Florida in trigger point release techniques and in Hawaii in soft-tissue release techniques. These techniques were combined effectively while Karen worked in Hawaii as she helped many people become pain-free after years of being incapacitated. Ready to get started? Check out our cleanse programs, sports rehab, and more.